It's the world's greatest litter box. Booda Dome Clean Step combines all the best features into one stylish litter box. 99% odor free. 50% bigger than your average litter box. Accommodates cats of every size. Clean-step ramp keeps the litter in the box, not on your floor. Covered for privacy and cleanliness. Your cat can dig to his heart's content without scattering the litter from the box. Built-in handle. Made of easy-to-clean plastic. Makes clean-up even easier with Booda Liners. Sold separately. Complete the set with a color coordinating Scoop & Hide. This 2-piece unit features a sifting scoop that works on all types of litter and a stylish hideaway. Sold separately. Made in the USA. A nice solution to traveling cat litter. As an owner of three cats, my wife and I were not pleased with our open-air shallow litter box. We are sure to scoop at least once daily to remove the odor from our laundry room and to keep the kitties happy with a clean box. Unfortunately, one of our cats, in particular, seems to enjoy kicking litter as hard as he can, the result of which was piles of litter on the floor that would then get kicked and tracked around the tile floor. None of the various rugs or mats we bought was capable of containing the mess. Frustrated, we went to the local pet store to look for a closed litter box to reduce the potential for kicked litter mess and to lessen the inevitable smell. 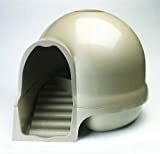 I put no price on products that ease litter box maintenance, so we didn't hesitate to spend three times as much as the typical shallow litter pan on this 'specialty' box. The design, at first, seemed flawless. The litter stayed in the box, very few granules found their way onto the floor, and the mat in front of the stair case was able to keep up with those that did. I noticed very little odor control improvement, even with the supplied filter, but we were happy with the litter control. Five months later, however, it wasn't "working" as described; Buddy, the messy cat, had begun to kick litter down onto the stairs, which would then inevitably spill out and make a mess. It became part of the daily routine to completely clean out the stairs due to all the litter accumulation. Last week was when we started finding pee in the stair case. Trust me, we keep the thing as clean as possible - I even completely washed out the box thinking that if I removed the odor from the stairs with cleaner they'd quit doing it. Nope. Then they began peeing in the stairs first, then scooping litter out to soak it up. Talk about a mess. I'm fine with scooping daily - but not with that nasty chore. Another terrible design flaw is the two corners of the litter area are impossible to scoop - and of course, our kitties loved using the corners. Even our narrow scoop didn't fit the contours of the corner, resulting in broken clumps and more frustration. A typical box-design enclosed litter box works far better and provides more litter space as well. I'd have to refrain from recommending this product. It took the seller more than 2 weeks to deliver the product to me and when I got it the item was broken and the lid did not fit properly whatsoever. I was very disappointed that it took longer than they had promised and was damaged upon arrival! And on top of that the damage was not damage that could have been caused from shipment. It had to be damaged prior to them packing it. I bought one of these a few months ago with the hope that my two cats would stop flinging litter all over the kitchen. One of them has a tendency to leap out of the box when he's finished his business, while the other digs as if she's on her way to China. We had a normal square covered box at first, but I figured this would solve the problem. It did, for a while. Like the other reviewers, however, I do notice that the box needs another wall at the entrance. The box itself is also far too small for two cats and needs to be scooped on a daily basis; even with the odor control panel, it stinks up my apartment (sometimes even when it's scooped daily!). The top of the box does not latch on to the bottom, meaning that with enthusiastic diggers, it gets nudged off the bottom...leading to cat waste outside the box thanks to them backing up against the walls. Even with the litter liners, this thing is a pain. * Our 14 pound, taller than average, cat fits fine. * However, the lid doesn't lock well and our cat used to knock the lid off. * I now slip a 2.5 pound weight under the lid handle and it stays on fine. * My cat can fling litter around like crazy without making a big mess. * However, he still manages to track some of his Feline Pine out of the box. Booda's fancy stairs catch some but not all. * The box keeps the stink in pretty well, which is good and bad. We have to remind ourselves to change the box. It won't stink on the outside but can be totally rank on the inside. If we forget to change it, our cat won't brave the stink inside and will use something else. * Most liners won't fit this box. We buy the Booda brand made for this box. * We only change the carbon filter around twice per year. The filter does do something, but not so much that it's worth changing all the time. Overall, I join in with those who've said I would definitely buy this box again. My cat Steve's back legs and hips have been getting progressively weaker (he's over 18) which makes it difficult for him to get up and over the lip of traditional litter boxes. The low entry way and ramp on the Booda are great for him to get in and out of the box easily. Steve also has kidney problems which necessitates subcutaneous fluid treatments to help flush his kidneys. This means he urinates frequently so the litter box fills up quickly. The Booda's litter pan is big and deep so it can handle all the little stops he makes without getting too dirty. We always kept our litter boxes in the basement, but once Steve was no longer able to navigate stairs easily he started to have accidents on the 1st & 2nd floors of our house. We decided to put a litter box in the dining room but it was always a big ugly mess. Litter would get everywhere and he would sometimes pee just outside the box even tho' he was standing right in it (lots of fun). The Booda solves all this with its hooded design. Steve is fully "contained" in there and the dining room smells way, way better. - The ramp has undulating ridges with little plastic nodules on it to (theoretically) de-litter-ify cat feet. In practice however, Steve runs down the ramp as fast as possible (uncomfortable on his pads I imagine) and usually ends up slipping a bit. To fix this, I cut out a section of an old bath mat and covered the ramp with it. This gives him soft traction and also rubs the excess litter from his feet. Bath mats are perfect since they have rubber backing on them that grips the ramp and doesn't slip down the incline. Also, when the mat gets dirty I can just throw it in the washer. We have three full grown cats and have had this box for a couple months now. I don't want to mess with two litter boxes so it has to be cleaned daily. I purchased it because of the unusual design and mainly because the dog kept getting into our other litter box. 3) Lid getting bumped off while cat is moving around (Hasn't proven to be too much of a problem. I wouldn't park it on the oriental rug if you know what I mean, but as another reviewer mentioned, the key is to put the lid on starting on the front on either side of the steps and make sure it's completely connected.) I really wish they would have just put clamps on it. My biggest problem was the charcoal filter... I don't know if it was jacked up when I got it or something, but it was the stupidest looking contraption I had ever seen. It was two circular "holders" joined by a strip of plastic. One end fit under the handle on the inside of the top of the lid, and the other I guess was supposed to hold the filter and clip onto the inside side of the lid? If that's truly how it was supposed to work, it didn't. I ended up intentionally snapping off one end and gorilla gluing the other circular piece under the handle so there wouldn't be a gaping hole. I don't even use the filters, which I personally think don't actually work anyway. Mainly the incredibly crappy plastic construction irritated me. I didn't even bother with the plastic liner because common sense dictates that an animal with claws scratching will make quick work of a so-called "convenient" plastic liner. If only it were that simple. But I won't complain - whoever invented clumping litter was a genius. If you're purchasing this to keep litter on the floor to a minimum it does work... honestly, just forego the cute little cat-head shaped ten dollar mat at Petsmart - go to Walmart and buy a 2 dollar outdoor mat to put in front of the box. I've always done this and it keeps them from tracking. The stairs do catch most of the litter (surprising amounts at times) so it needs vaccumed weekly or so, but I have never had problems with them peeing on the steps. -The liners are not big enough for the box. -the traditional cat box with handle and side attachements are much easier to empty. -stairs were a bonus, but not for all the yucky mess that goes with cleaning this huge unhelpful box.